Crossroads Coffee & Ice Cream serves breakfast, lunch, and dinner in addition to coffee and ice cream. They also have vegan and vegetarian options. 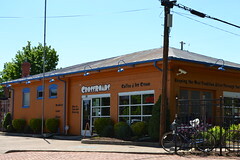 At Crossroads Coffee & Ice Cream there is an on-going concern for the environment that carries through to their daily operations as they participate in a recycling program and try when possible to make environmentally friendly decisions that affect their trash output. They have migrated towards biodegradable cups and plates in addition to purchasing more recyclables for their stores. They are open from 7am - 10pm, 7 days a week. They offer free wi-fi and are bicycle and pet friendly.